The Skyline is a 160 sq. 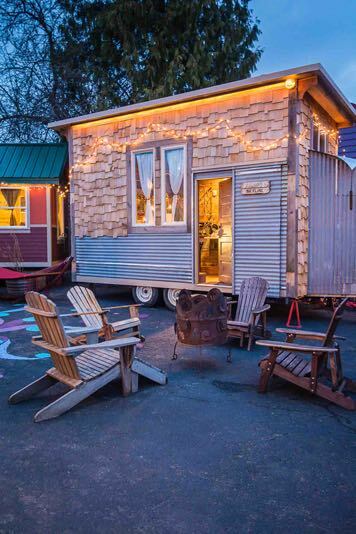 ft. tiny home on wheels in Portland, Oregon’s Caravan Tiny House Hotel. Hotel guests can choose from a variety of other tiny houses on trailers to spend the night in depending on availability. Occasionally they even host tiny house tours. It’s a great way to spend your next vacation if you want to experience what it’s like living in a tiny house. And if you’re seriously considering going tiny, I’d say this is a must before you consider building. This way first you can make sure it feels right. If you want, check out the tiny house vacations category here at Tiny House Talk for even more options. You can easily send this page to your friends and family using the social and e-mail share buttons below. Thanks for sharing! If you enjoyed the Skyline Tiny Home at the Portland Tiny House Hotel you’ll absolutely LOVE our Free Daily Tiny House Newsletter with even more! Thank you! I think this is very well done and looks comfortable. One thing I don’t live about motels/hotels is the uncomfortable chairs. That couch looks very inviting. I would find this very uncomfortable. It’s SO DARK. It’d feel like living inside a crate, which essentially you are, but bright paint and more light would at least make it more bearable. Same here. Much too dark; I’d feel like I were in a cave. Otherwise, I very much like the set-up, especially the bunks. It’s a rental unit in Portland. Plenty of painted white rentals to choose from if this isn’t to your liking. I’d prefer this wood looking one assuming they were similarly priced. This looks comfortable to wake up in compared to the usual beige walls usually in hotels. Love. Love. Love. The railing/steps to the loft. Also the triangle toilet bowl looks like it would save some bathroom space. But the brown …. Although I like brown, this one has a bit too much of a good thing. Walls, furniture, window coverings, even some of the books on display. At least the toilet is green and the kitchen sink/fridge is white. Wonder where the ladder in the bathroom goes. Overall, I love the design. Going in my keep for good ideas file! Mom and I are already planning to stay at the Caravan TH Hotel while we are waiting for our THOW to be built. The owner does such a good job of things and I love the fact you have a choice of accommodations. Very nice work. It looks cozy. The natural wood look has so much warmth and variety of color as well as being ecological. I don’t understand all the criticism. The small house allows freedom to make your vision a reality. Keep it positive, and design your own dream. One person’s dream may be another”s nightmare. I love this one. It looks so warm (color-wise) and peaceful. Cathyann…I was wondering about those ‘toilet stairs’ too…whats up with those? I actually love the darkness and I find it cozy..normally I am extremely warehouse Uber contempory..with a touch of Scandinavian WHITE for everything…but i find this place like the womb! For living: the upper loft for living and bottom for bedroom. Btw>I still need lots of storage and a w/d too. Maybe stairs are for towels? Like your comments….but pray tell, what is a w/d? Serves me right for not being domestically oriented. Carrie & CathyAnn…I don’t think that those are stairs. It looks like shelving. The way that the wood is stained gives the impression of a ladder. Ingenious! I like it!! Well if its not shevling, it should be! Lol. I like a lot of the design elements, however I agree with Carrie I would need a tad more storage, even though it is a tiny hotel cottage. It still looks very warm, cozy & relaxing. Carrie, I’m assuming that’s why there is no w/d as well because it is a tiny hotel cottage & most guests have short stays maybe? I love the rustic look, beautiful! I think this is absolutely beautiful!!! Warm and cozy. Love the upper and lower living areas. Different style than most that is very refreshing! Looks cozy! Thanks so much for posting this. I am curious why that was decided? This is a beautiful and comfortable TINY HOUSE. And I think a few nights stay at this place could be fun. Also, if you haven’t, check out the bar/restaurant right next door to the motel. It looks very nice. It’s called The Bye Bye! Normally I prefer more light and lighter colors in small spaces but this is an exception. Warm, cozy and soothing to ones soul is how I would describe this cutie. Here in Florida with our high humidity I am thinking that building it from Slash Pine (a.k.a. Dade County Pine) or Cypress would be a must. We have real issues with termites and wood rot. Also, I am believe a white enamel steel roof with a 6 foot overhang would go a long way towards keeping the house cooled down in our long summer season (essentially April to November). But from a single guy’s perspective, this house is just right! Steve and Suzanne Yes, I love the white metal roof idea too with a huge overhang..I am here on the bayou in Mississippi….need heat reflection and rain protection. Susanne…you are right….while I am but a mile west of the cooling breezes of the Indian River, I am mostly in the Florida Flatwoods. …gets a bit sunny of there. But oh so pretty! Also I should think a ten ft. ceiling to be a must. The hot air has gotta go somewhere! I know this is pretty dark inside but boy it’s awesome as far as I’m concerned. It just looks so darn homey, warm, inviting, and a place I wouldn’t mind being at all!! I think it’s a GREAT home. I have stayed in Skyline at Caravan and it is extremely comfy & cozy! I heartily recommend this experience for anyone looking to downsize or checking out the tiny house scene. It really gets the creative wheels turning :). The ladder behind the toilet extends out in front of the toilet (pivoting on the lawn mower handle) to allow acces to to window and storage above. Older post: Portable Nomadic Hot Tub For Your Tiny House?